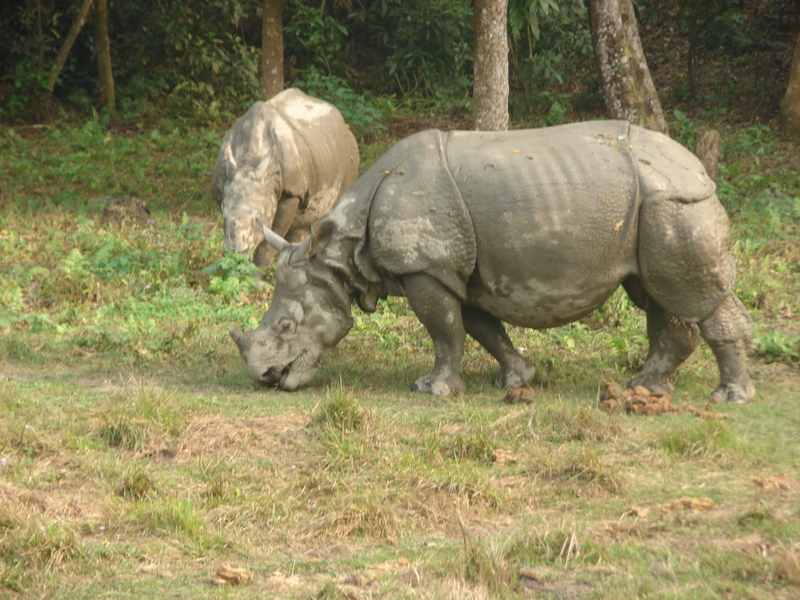 Chitwan, Nepal – Data from the three-week National Rhino Census in Nepal shows that the population of the greater one horned rhinoceros (Rhinoceros Unicornis) has increased. There are 534 rhinos in Nepal, marking an increase of 99 rhinos from the 435 recorded in the last census in 2008, according to the census results, which were released Saturday. Of that total, 503 rhinos were recorded in Chitwan National Park (an increase of 95 from 2008 data), 24 in Bardia National Park (an increase of 2 from 2008 data) and 7 in Shuklaphanta Wildlife Reserve (an increase of 2 from 2008 data). These numbers reflect the success of conservation efforts for this species and are a result of improved rhino protection measures and management of habitat. The rhino counting was conducted simultaneously in Chitwan National Park, Bardia National Park and Shuklaphanta Wildlife Reserve of Nepal’s Terai Arc Landscape, and was a combined effort of the Department of National Parks and Wildlife Conservation of the Government of Nepal, WWF Nepal and the National Trust for Nature Conservation. WWF provided technical as well as financial support for the National Rhino Census. This is a fine example of working together where all conservation partners and local communities are contributing to the conservation efforts of the Government of Nepal, says Krishna Prasad Acharya, Director General of Department of National Parks and Wildlife Conservation. Support received from WWF Nepal is appreciated and we are hopeful that this support will continue in the coming years with more vigor, Mr, Acharya added. The positive result of the National Rhino census 2011 is an indication of the successful conservation efforts of the Government of Nepal in partnership with conservation partners. WWF Nepal is very pleased to see our investment being paid off, says Mr. Anil Manandhar, Country Representative of WWF Nepal. Even though the current census shows the rise in rhino number we cannot be complacent and therefore continuous efforts from all sectors is essential to protect endangered species like Rhino and their habitat. "We are much encouraged that increased WWF support to the anti-poaching efforts of Government of Nepal has actually resulted in an increase in the Rhino population within three years," says Dr. Christy Williams, WWF’s Asian Rhino and Elephant Action Strategy coordinator. "WWF Nepal acknowledges with gratitude the support received from the WWF US, WWF UK, WWF Finland, WWF Netherlands, WWF International, US Fish and Wildlife Service, National Trust for Nature Conservation and all other contributors, particularly local communities and private sector for this conservation endeavor," says Dr. Ghana S Gurung, Conservation Program Director, WWF Nepal. Based on this encouraging result now we need to come up with strategies to build a thriving population in the Terai Arc Landscape, Dr. Gurung added. Today, rhinos mainly are threatened by habitat loss and poaching, and worldwide few them survive outside of national parks and reserves. The greatest threat to rhinos is the demand for rhino horn, used in traditional Asian medicine to treat a variety of ailments. Although international trade in rhino horn is banned under CITES (Convention on International Trade in Endangered Species of Fauna and Flora) and although some traditional medical practitioners are using alternatives to rhino horn, the demand for horn remains high. Habitat loss is a concern too, especially in south-east Asia and India, as human populations rise and forests are degraded or destroyed.